Glamping or glamour camping has become more and more popular. People are not tied to conventional camping in the forest or suburban area anymore. Urban glamping is a new trend in travel world these days. Thus, you might as well starting to research about urban glamping destination to pick for your next camping plan. Glamour camping is a more fun and luxurious way to camp. This type of camping offers luxury and irresistible facilities. Urban glamping is another level of just a mix of luxury and camping. The atmosphere of the city is what makes this glamping is different. You can camp under the stars at night and enjoy the world-class attractions to the fullest. Notel, Melbourne, Australia is one of the most unique pots for urban glamping. The location is on the roof top of a parking lot. In this place, you will find six chrome airstream trailers. Those are refitted to become perfect accommodation for camping. There are facilities you will enjoy during your glamping here such as Wi-Fi, iPad, and queen sized-bedding. Ensuite bathroom along with cooling and heating system are also available to accommodate your comfort during your stay. 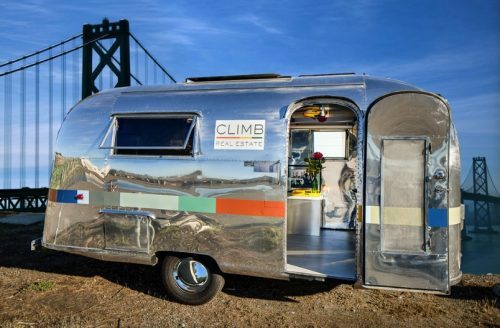 Vintage Caravan, Oakland, California is urban glamping destination you won’t regret to try. Even though the camp is made up of vintage caravan, you will receive luxury in the form of modern convenience including mini kitchen, Wi-Fi, full bathroom with separate shower, and many more. The vintage caravan is painted with lively colors which make your camping experience more fun to do. Beverly Wilshire, Los Angeles, California is the next recommended urban glamping destination you can pick. This spot is located at Veranda Suite. It is more like studio-style complemented with European decor. If you are seeking for not only urban glamping but also the private one, this spot is the best to choose. There are luxurious amenities you can take advantage of such as comfortable bed, soaking tub, and mesmerizing view of the city. The Urban Yurt, Austin, Texas is one of urban glamping spots you can try. It is located at the heart of the city. Facilities you will enjoy while urban glamping in this site are private outdoor shower, communal fire pit, HD projector, and many more. It is easy to find the best restaurant, bars, as well as attraction while glamping in this spot. This urban glamping destination is also the best place for stargazing. The greenery around the site is enough to make you feel connected to nature even when you are at the heart of the city.